Egglettes improves upon the older As Seen on TV product called Eggies which was rife with problems. Most people should find that it produces shell-free hard-boiled eggs in about 15 minutes, and its current online-only availability may be the only dealbreaker for some consumers. Egglettes are silicone pods that can be used to hard-boil eggs without the shell. You can get Egglettes for $14.99 + $3.99 P&H for a total of 18.98. This includes a set of 6 Egglettes plus a microwave egg sandwich cooker and recipe booklet. Egglettes is not available in stores as of this January 2018 writing. If you love hard boiled eggs but hate to prepare them, the makers of Egglettes may have just the item for you. 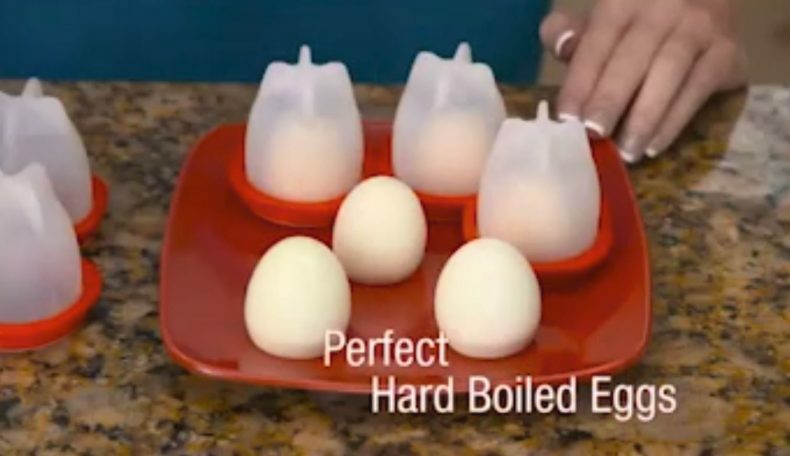 This set of six As Seen on TV egg cookers allow you to easily hard-boil eggs after they have been removed from the shell. To use Egglettes, you unscrew the top of the pod and crack open an egg into it. After replacing the top, you place the filled Egglettes into a pot of boiling water and wait. The pods will float around and you’ll notice the eggs beginning to turn white. How long it takes will vary on the size of your eggs and the consistency you like, but you can expect it to take about 15 minutes to produce hard-boiled eggs. When the eggs are finished, they will have a mostly egg-shaped design (thanks to the shape of Egglettes), except for the flat top, which is actually convenient because they can be stood on end. One problem you may encounter is that the opening of the pod is a bit small and your “aim” needs to be pretty accurate, or you could end up with egg running down the side. Another potential problem is cleaning, as there will likely be bits of egg left behind once the eggs have been popped out. The lids also need to be washed off. All of the parts can be placed in the dishwasher, but due to their small size you’ll need to place them in the dishwasher in a way that they won’t fall or be tossed around. Depending on your dishwasher, it may be easier to secure the pods in the silverware basket so they don’t fall upside down and collect water. Overall, Egglettes improves upon an older As Seen on TV product (discussed below) in several key areas. For that reason, I feel that it is a welcomed addition to its category. The minor problems mentioned above probably aren’t enough to dissuade anyone from using Eggletttes, although its current availability could be. Egglettes are not yet available in stores, and was test marketed as recently as mid-2017. Its current advertising push tells me that they may have ramped up production, but shipping times still may be slower than you might expect until they get rid of the current backlog of orders. When Egglettes becomes available in stores, it will be a much better purchase without shipping costs and delays. A discussion of Egglettes would not be complete without mentioning its As Seen on TV predecessor known as Eggies. This older product looks and functions nearly identically to Egglettes, except perhaps for the material from which it is made. Egglettes are made of nonstick silicone while Eggies are made of plastic. This may seem to be a minor difference, but keep in mind that with Eggies you were supposed to coat the inside with oil, a step which is unnecessary with Egglettes. Another slight, but important, difference between Eggies and Egglettes is that the harder material of Eggies made it difficult to pop the eggs out once they were cooked. These two changes make Egglettes an improvement over Eggies. Have you tried Egglettes? Please give it a star rating and comment below. Can it not be used in the microwave? That would be so much quicker! Build is ok. Silicon bottom. There’s a hole on top of the cover to vent the egg and problem is when the egglette floats over boiling water, it topples over and the egg inside leaks out of the hole and mixes with the boiling water creating floating egg whites and wasting the egg. after cooking there is a membrane on the outside of the egg. it has no taste but a bad texture. I will not be using these again. don’t waste your money traditional boiled eggs are the way to go.